VIDEO: Easy Fast 5-Minute Inflation! Stowed Dimensions: 3' 11" x 2' 2" x 1' 4"
An additional $60.00, Large Package Surcharge Fee, imposed by the carrier, will be included in your shipping charges. If you would like an e-mail of our standard full-line price list in an Excel spreadsheet please request it by sending an e-mail to inflatables@defender.com . The file is over 1MB and your account must be able to receive the reply with the file as a 1MB+ Excel file attachment. Boat Length: 11' 5" to 12' 4", Max. 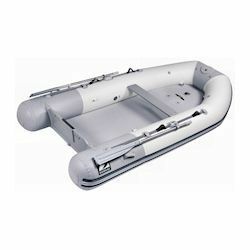 Beam Width: 70"
C-Level 3-Point Dinghy Towing Bridle for Inflatable Boats-DEFENDER EXCLUSIVE! !